Portland City Council and the Port of Portland are in the midst of planning to allow developments on West Hayden Island, despite pleas from environmentalists and some East Hayden Island residents. Plans would include annexing the 800-plus acres west of the BNSF railroad -- a largely untouched parcel of land -- into the city to enable the Port of Portland to build a deep-water marine terminal and industrial complex. Currently, the land is owned by the Port but under county jurisdiction, inside Metro's Urban Growth Boundary. Included in the study will be a possible new bridge, rail service, and more coordination with the Port of Vancouver. Near the confluence of the Willamette and Columbia rivers, West Hayden Island provides a unique habitat to many species of plants and wildlife. It is also a prime location for a marine terminal and industrial facilities. A potential 300 acres of land could be used for the development, with 500 acres remaining as protected natural space, possibly to be used for recreational purposes. EcoNorthwest has been hired to create a cost benefit analysis, and WorleyParsons has been contracted to create a concept plan. 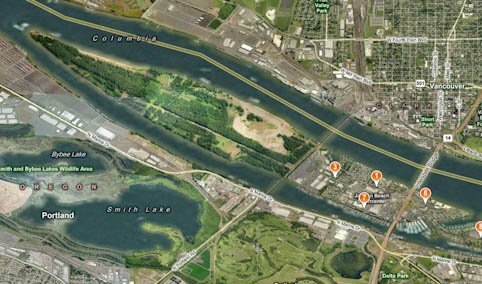 According to the Port of Portland's website, there is a "scarcity of waterfront industrial lands" within the city. The Portland Plan calls for an additional 600 acres of industrial expansion within city limits. "The purpose for this is to plan for the future," says Josh Thomas, spokesperson for the Port of Portland. "Typically, when a need arises, if you don't have a shovel-ready facility or land available for a company to set up operations . . . you can't say, well, we could come up with a site for you within 10-15 years, because most don't have the patient capital or the time to wait." City council voted in July 2010 to allow staff to investigate and plan future expansions on West Hayden Island, despite the fact that a community working group put together by Sam Adams could not agree that it is possible to "reconcile marine industrial, habitat and recreational uses on West Hayden Island," according to a report issued July 29, 2010. Conservationists say the 500 acres of preserved natural landscape is not enough. "West Hayden Island, because of its size, complex mosaic of habitat types and location at the confluence of the Willamette and Columbia Rivers is a unique and irreplaceable natural resource," Bob Sallinger, Conservation Director at the Audubon Society of Portland responded via email. It is home to many species of birds, including neo-tropical migrant species, woodpeckers, and bald eagles; it provides shallow water habitat for endangered salmon and steelhead species; and it supports 4 percent of cottonwood-ash trees on the Columbia below the Bonneville Dam. Development would destroy one of the remaining large grasslands in the region. Only 1 percent of historic Willamette Valley grasslands remain, according to Sallinger. "[Development] will remove a critical piece of a system of natural areas that remains along the Columbia River reducing the overall functionality of the entire system," Sallinger says. "[West Hayden Island] is also a floodplain which has been partially or completely underwater a couple of times over the past decade -- exactly the kind of place we should not be developing in an age of climate change." Ironically, it is because of dredging that much of this land exists. The website West Hayden Island Facts states that roughly 30 percent of the island's land mass is the result of 75 years of dredging. "The island is made of sand," points out Tom Dana, a board member on the Hayden Island Neighborhood Network who is opposed to the possible terminal. He was also involved in an earlier community working group set up by Mayor Sam Adams to discuss the possibilities for West Hayden Island. Dana lives in the manufactured homes community on Hayden Island, the closest residential area to the land in question. His concerns include the noise, fumes and road degradation that might occur from heavy truck traffic, as well as whether or not the purposed terminal is even necessary. Bluntly, he says, "I don't trust the Port of Portland." Sallinger does not believe the Port is using its current facilities to their full potential. "Natural resource issues aside, we do not believe that the Port has done an adequate job of demonstrating need for this project or exploring other alternatives such as more efficient use of the existing developed landscape or better collaboration with the Port of Vancouver," he says. "The Port was heavily criticized by the Business Journal of Portland back in 1999 when they last tried to annex and re-zone West Hayden Island for its desire to destroy critical habitat rather than explore how collaboration with Vancouver might lead to more efficient use of the land base. More than a decade later they still have not sufficiently addressed those issues." "We have some available property but nothing this size. All of our terminals are active. Terminals 2, 4, 5, and 6 are all active marine terminals and working with a variety of operations," he says. Thomas says this is necessary now. "We're basing it on a future need starting today, so that when that day comes, and we need [another marine terminal] available, we've done the footwork . . . have a plan in place, and we have the property available." As for the additional 300 acres of development called for in the Portland Plan, Thomas says, "Our property staff are continually looking at areas for potential development to support jobs and the economy in the region. "We're looking at creative property use to use existing properties, to identify underutilized properties, and also to identify new sites like this one." Thomas also says that it is too early to project possible revenue and job creation the purposed West Hayden site may provide. Both would be determined by specific use, as well as the type of facility built. Coordination with the Columbia River Crossing and the city's area plan for East Hayden Island are also reasons why development is important now. Candidates in the upcoming elections seem to be weighing their options before choosing a side. "We should be able to responsibly develop a portion of the island to create new jobs, while setting aside a large part of West Hayden Island for habitat and wildlife," candidate for mayor Eileen Brady's campaign said in a statement. "We don't have all the facts, we haven't met with both sides, which Steve feels is crucial before actually forming an opinion," says Louis de Sitter on behalf of Steve Novick, who is running for City Council, adding that Novick has had a tour of the area. "We've got some meetings set up over the next month or so . . . with both sides to make sure that we have all the facts straight before [Novick] starts developing an opinion." "If we can work together with the Port and the City of Portland, I'm sure we can figure something out," says mayoral candidate Max Brumm, adding, "There has to be some sort of balance between the success rate and the money being made and the jobs being created and also conserving the environment." Charlie Hales, who is running for mayor, could not be reached by press time. The proposal is to be planned by December 2011. Upcoming meetings include an advisory committee meeting Friday, August 19. On October 12, a joint Port and City Council meeting on the proposed concepts will be held, including visual representations of the site and infrastructure. A series of public workshops will begin in late October. More information is available on the Port of Portland's website, at www.portofportland.com/WHI_Home.aspx. Note: Multiple unsuccessful attempts were made to connect with Mayor Sam Adams and the Portland Bureau of Planning and Sustainability before press time. Questions for the mayor include whether the West Hayden Island project is a priority for the end of his term, and if he feels it would be possible to complete it within that time frame. It was hoped that BPS would be able to provide concrete numbers for the project's expenses. Phil Nameny, city planner, was able to say that the consultant WorleyParsons was hired at $359,916, but advised this reporter to contact Eric Engstrom, Principal Planner, for the rest. Engstrom did not return my calls.